Las Piedras At Sevano Village, by Columbia Communities, is a gated community of 64 luxury single-family homes, with spectacular rock outcroppings adjacent to the community. Close to both world-class dining and shopping of North Scottsdale, and the beauty of the high Sonoran Desert. Also known as Las Piedras at The Summit. Solstice At Sevano by Cachet Homes is a gated-community of 78 attached residences - some of which back the Whisper Rock Golf Course. Solstice at Sevano Village offers front entry courtyard in two with a den and three bedroom plans. Each with two-car garage. 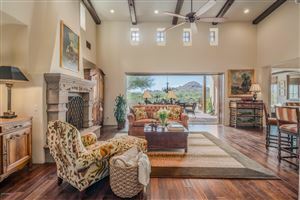 Whisper Rock Estates is a new exclusive guard-gated golf community 200 homes on 850-acres in North Scottsdale which offers large custom home sites, ranging from one to five acres. Homesite have lush desert vegetation and superb 360-degree views of the McDowells, Pinnacle Peak, Black Mountain, Tonto National Forest. Whisper Rock Estates is a new exclusive guard-gated golf community where you will find traditional American Southwest architecture on home sites that average 2+ acres, some of the largest in a Scottsdale master-planned community. Whisper Rock Estates is a new exclusive guard-gated golf community. Whisper Rock Golf Club strives to provide players with the finest golf experience possible. Whisper Rock's membership is limited to 580 golf memberships for the 36-hole facility. Whisper Rock's club is focussed on golf rather than other amenities, though amenities do include walking paths, library, 3 acre park, fitness center, 2 tennis courts, half basketball court, grassy park, 24-hour guard-gated access, and conceirge services including dry cleaning and grocery arrangements. Pinnacle Peak Ranchos on the North and South side of Lone Mountain, is an 280-acre subdivision. Most Pinnacle Peak Ranchos homes were built between 1995 to 2010. There are several new construction homes in Pinnacle Peak Ranchos. Homesites are roughly 2 to 5 acres more and all have fantastic views of the High Sonoran desert as well as majestic views of Lone mountain. Panoramic mountain views and rolling desert terrain sprinkled with age-old Saguaro and other vegetation that maintain its natural wildlife. Average square feet in Pinnacle Peak Ranchos is roughly 4000 square feet. The Pinnacle Peak Ranchos community has trails into City of Scottsdale's McDowell Sonoran Preserve to the East, and horses are allowed. Villas at Whisper Rock Estates are the only properties on Whisper Rock golf course - only 15 lots. Standard features include Viking appliances, Kohler fixtures, travertine flooring, , knotty alder front entry door, and more. The original Villas were built by Cachet Homes. Phil Nichols will do a built-to-suit on the last 7 lots. Bellasera is a guard gated community of 360 homeowners and is situated on 290 acres. Approximately 40% of its land is protected wild and unspoiled desert. As a guard gated community, Bellasera provides intimacy and exclusivity to a mere 360 uniquely designed homes. You will find nine (9) different home plans ranging from approximately 1,395 to 3,900 square feet. Sincuidados is a guard gated luxury home community with tennis courts and clubhouse, private streets, with 24 hour roaming security. Many cul-de-sacs throughout. Square footage ranges from 2900 to 7000, with almost all homes in the community of Santa Fe or territorial style architecture. Some homes were part of the original working ranch. Whisper Rock Estates is a exclusive guard-gated golf community on 850-acres in North Scottsdale which offers large custom home sites, ranging from one to five acres. Other gated communities in the Whisper Rock Area include Las Piedras, and Solstice at Sevano. Pinnacle Peak Ranchos is adjacent to Whisper Rock to the South. 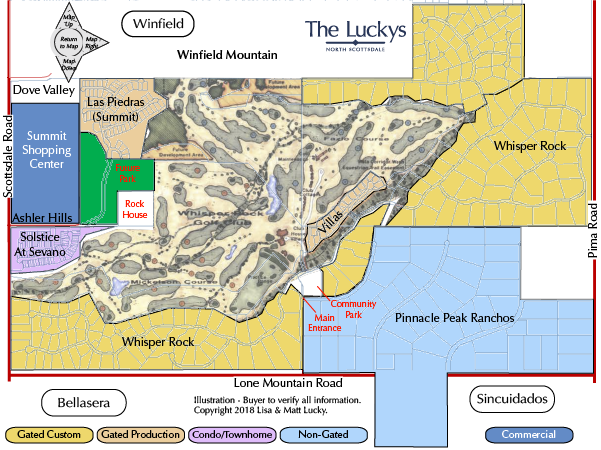 Click for an example Whisper Rock Estates property video The Luckys created. See all Whisper Rock Area - New. See all Whisper Rock Area Sold.